Kenneth C. Wisnefski, founder and CEO of the top rated search engine optimization firm, announced that “social media will play an integral role in this year’s black-Friday shopping day”. Black-Friday is the traditional kick-off to the holiday shopping season. This year, as more and more companies have adapted to the upsurge in social media demand, Wisnefski expects both retailers and consumers to communicate through the versatile platforms including Facebook and Twitter. “Traditionally, retailers and merchants release their door-buster deals up to a week before the big event”, states Wisnefski. “While this trend will continue to some respect, I expect the majority of merchants to heavily advertise on social media platforms including Facebook and Twitter”. Not only are merchants expected to advertise their deals on social media, consumers are expected to rely on these platforms to have information in real-time throughout the day on Friday. Industry statistics from comScore reveals 87% of Americans who own a smartphone access the internet at least once daily. Consumers looking to capitalize on the best deals are expected to be following the Twitter handle and Facebook page of their favorite retailers while they are amidst the mad-rush. “For the consumer looking to be successful and take advantage of the most deals on black-Friday, they need to have the most updated information all-day long”, states Wisnefski. “Information including up to the minute updates in inventory and pricing in addition to reading consumer reviews on the go on their smartphones will be the main focus for consumers”. With the rise in demand for cost-saving mechanisms including buzz for coupon-cutting reality television, in addition to a drop in discretionary income, Americans are expected to leverage black-Friday deals in 2011 ever more than in year’s past. “At WebiMax, we represent over 100 retailers that will be leveraging social media next week. The reach of social media in addition to its effectiveness and cost efficiency make it the most closely followed dynamic this year. Consumers that need updates in real-time will rely on its effectiveness as they shop on black-Friday”, concludes Wisnefski. 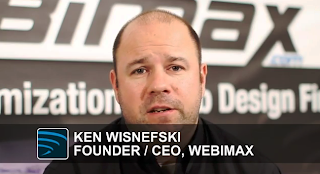 Led by serial web entrepreneur Ken Wisnefski, WebiMax has established themselves as a global leader in SEO services, E-commerce solutions, social media, web design, pay-per-click management and reputation management. The company is projected to gross $15 million in revenue this year. They have over 150 employees and 12 offices including 8 U.S. based, and 4 International. Visit http://www.webimax.com/ for more information.